NASA's Mars Exploration Rover Spirit took this panoramic camera image of the rock target named "Mazatzal" on sol 77 (March 22, 2004). 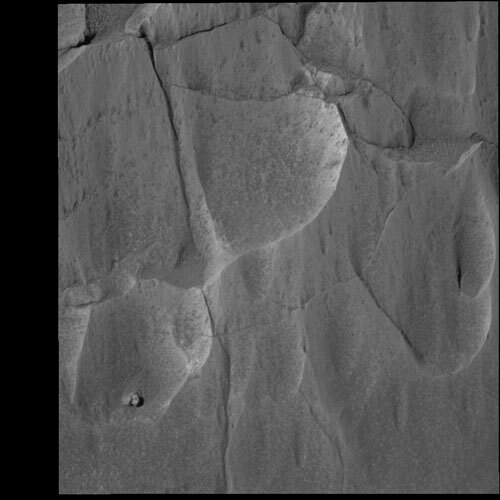 It is a close-up look at the rock face and the targets that will be brushed and ground by the rock abrasion tool in upcoming sols. Mazatzal, like most rocks on Earth and Mars, has layers of material near its surface that provide clues about the history of the rock. Scientists believe that the top layer of Mazatzal is actually a coating of dust and possibly even salts. Under this light coating may be a more solid portion of the rock that has been chemically altered by weathering. Past this layer is the unaltered rock, which may give scientists the best information about how Mazatzal was formed. Because each layer reveals information about the formation and subsequent history of Mazatzal, it is important that scientists get a look at each of them. For this reason, they have developed a multi-part strategy to use the rock abrasion tool to systematically peel back Mazatzal's layers and analyze what's underneath with the rover's microscopic imager, and its Moessbauer and alpha particle X-ray spectrometers. The strategy began on sol 77 when scientists used the microscopic imager to get a closer look at targets on Mazatzal named "New York," "Illinois" and "Arizona." These rock areas were targeted because they posed the best opportunity for successfully using the rock abrasion tool; Arizona also allowed for a close-up look at a range of tones. On sol 78, Spirit's rock abrasion tool will do a light brushing on the Illinois target to preserve some of the surface layers. Then, a brushing of the New York target should remove the top coating of any dust and salts and perhaps reveal the chemically altered rock underneath. Finally, on sol 79, the rock abrasion tool will be commanded to grind into the New York target, which will give scientists the best chance of observing Mazatzal's interior. The Mazatzal targets were named after the home states of some of the rock abrasion tool and science team members.